We always have at least 9 True E.V.O.O’s on hand! We ensure that we have the freshest Extra Virgin Olive Oils, that exceed ALL International Standards, by importing from small farmers in both hemispheres! Theses are some of the finest “Fruit Juices” available in the world! In addition, we offer over 40, uniquely Infused Olive Oils and Balsamic Vinegars, as well as some specialty Oils, providing a match for anyone’s palate. All of our products are versatile, making not only great vinagarettes, but, flavorful marinades and finishing touches, on everything from appetizers to desserts! A visit to Blue Moon, is truly a unique tasting experience. All of our products are made available for tasting from our stainless steel containers called “Fusti’s”. You are encouraged to fill your own bottles, as none of our bottles are pre-filled, enforcing the fact, that what you’ve just tasted, is what’s going in the bottle. No question of when or where the bottle was filled, or what the contents tastes like. We hold open to the public Tastings every Friday and Saturday Night, at no charge, in our “Tasting Parlor”, through reservation. An assortment of products are showcased and tasted, along with a presentation of quick and easy applications to help give ideas, on how to use our healthy, FRESH, and delicious products! A visit to one of these eye-opening events, will provide you with the knowledge to become a better consumer, when it comes to purchasing Olive Oil and Balsamic Vinegar. The Parlor is also available, to provide a unique place, for private events/parties or networking meetings! We also provide unique favors, perfect for your Special Event. Weddings, Showers, Birthdays, Retirement Parties, Office Parties…any Celebration! We’ll work closely with you to design an attractive set, that best suits your needs. Custom labeled, with your choice of text and color, in a gift bag and wrapped with a bow! The perfect gift to say “Thank You”, in a way that your guests will truly Love! 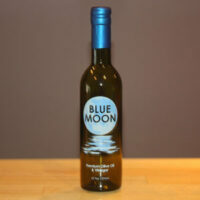 Blue Moon Premium Olive Oil & Vinegar, truly is a Unique Tasting Experience! Thank You for allowing us to serve and educate you, on the benefits of purchasing our products! Taste the Difference! We want to see you, at THE MOON!